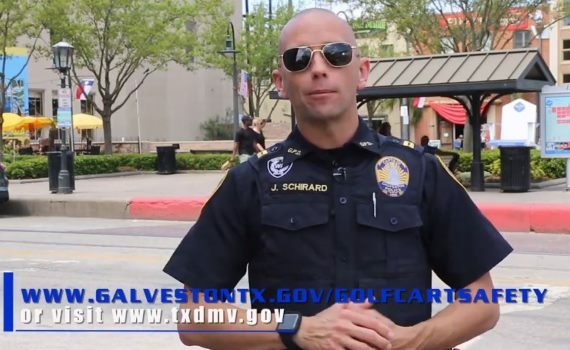 Video from the Galveston Texas City police on the golf cart rules and regulations for roads and city streets. Galveston City Council passed an ordinance that went into effective on March 24th, 2010 that must now be followed. The city of Galveston Texas, requires a registration fee of $25.00 in person or by mail to 601 54th Street, Galveston Texas, 77551. All checks should be made a payable to the City of Galveston. A copy of your insurance card should be sent along with the registration form. Applicants must attest to the fact that they are in compliance with the ordinance prior to submitting the application and associated fee. Appropriate registration stickers will be issued by return mail. Thanks to Galveston Police Tube channel for the video. This info is subject to change and you should contact local government if you have any doubt about the laws.